Shutters make a fabulous addition to any home. They are classy, easy to use and enable you to control the amount of light and ventilation coming into your home at all times of the year! At North Coast Blinds & Security we are the Sunshine Coast experts on fitting shutters in a range of materials including Cedar, PVC, Basswood and Aluminium. Following a visit to your home to measure-up the space where you want new shutters, we then have them custom-made according to the specifications and install them in your home. As well as being used as window furnishings, Shutters are now increasingly being used to divide up a space (see below) or close off a room, while still ensuring light can get through. As well as being functional this can also add a stylish decorative element to your home. Shutters are also good for providing insulation from wind and cold during winter and can be tilted to allow breeze to enter a room but not the harsh summer sun. 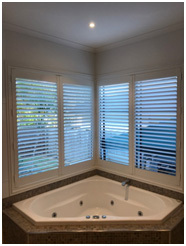 Using Shutters can really spruce up a room including bathrooms and are proving to be a popular choice for people renovating or redecorating. The choice of material (Cedar, PVC, Basswood and Aluminium) depends on the proposed location of the Shutters. For bathrooms, where moisture content is high (particularly in Summer on the Sunshine Coast!) we would recommend choosing PVC or Aluminium Shutters. Shutters can also be used as doors as the below picture shows – these Shutters are hinged doors, enabling the outdoor room to be opened up to the exterior and the breeze to flow in. PVC Shutters are made from quality extruded PVC with an aluminium insert in each blade ensuring the blade will not sag over time. They will not be affected by moisture or humidity. Easy to clean by wiping over with a damp cloth. Basswood Shutters are made from a high-quality timber called Basswood. They are available in 12 paint finishes or seven stained finishes. They are easily cleaned by wiping over with a damp cloth. Cedar Shutters give that elegant “Hamptons” look to a home.They also require more care when cleaning and shouldn’t come into contact with any moisture. Cleaning should involve dusting and use of furniture polish to get rid of unsightly stains and bring back their shine. Aluminium Shutters are extremely durable and probably the easiest shutters to maintain as they generally just require dusting or a quick wipe-down. If you are interested in getting Shutters installed in your home, call us for a free measure and quote today! Ph: 5456 2199.